Gold isn’t behaving like a safe haven should. While investors have endured torrid times as global equity markets have slumped, even worse tribulations may be required for the precious metal to regain its past lustre as a safe haven. Its price is down more than 3 percent since November 2015, even as the S&P 500 Index has declined 8 percent. And on Jan. 20, when a global equity rout pushed the MSCI World equity index down more than 3 percent, gold’s rebound fell almost $3 short of highs set earlier in the month. There are good reasons why investor panic is not translating into a bigger bounce in gold. First is the dollar’s rise. Gold is priced in dollars and usually weakens when the greenback strengthens. For example, the metal has risen nearly 5 percent in sterling terms since November. And now that Federal Reserve Chair Janet Yellen has raised U.S. interest rates, it is a bit less attractive to pay to store and insure gold holdings. Asian demand for the metal is also expected to be dented. Chinese retail investors, who tend to buy gold speculatively, have been burnt by domestic stock market gyrations and may be more cautious as domestic growth slows. Investors have no interest in buying it as a hedge against inflation in the western world, and in any case, any pickup in inflation would signal stronger economic activity and spur investors to buy riskier assets than gold. Another problem is that the metal has become a slightly less trustworthy safe haven. The past decade saw a surge in exchange-traded funds that track gold. This sort of more speculative investor demand nearly tripled to almost a quarter of the market after the financial crisis, according to Natixis analysts. Such buyers are quicker to bail than those who want to hold the metal in physical form, making prices more volatile. Gold probably still remains the safe haven of last resort. If there were a real financial meltdown – or a sharp reversal in the dollar’s fortunes – it may regain its shine. That will take grimmer news than the markets have yet had to face. 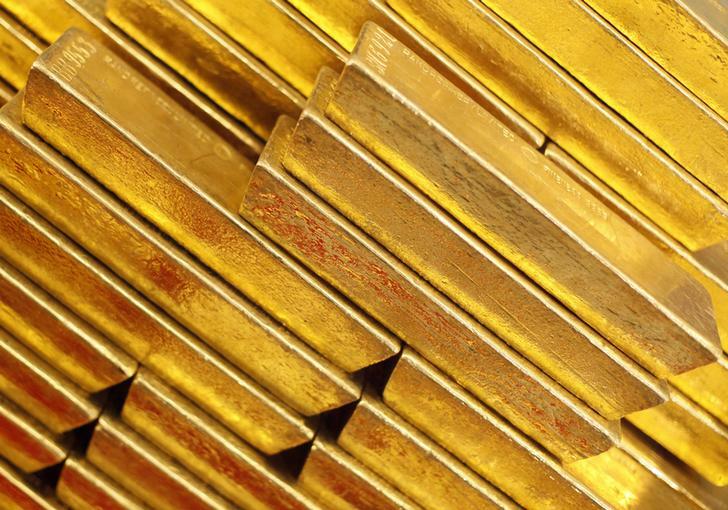 Gold bars are seen at the Czech National Bank in Prague April 16, 2013. The price of gold has fallen 3.3 percent since the beginning of November 2015. It was trading at $1,102.80 an ounce at 0900 GMT on Jan. 25. During that period, the S&P 500 Index has fallen 8 percent, to 1906.90. The price of gold rose 2 percent to as high as $1,109.20 an ounce on Jan. 20, the day that the MSCI All Country World Index fell as much as 3.4 percent to hit a two-and-a-half-year low of 352.10. Gold did not, however, surpass the high of $1,112 an ounce it had set earlier in the month.